March 14, 2018 – Earlier this month, RK’s Marketing Department received the first place award at the Society for Marketing Professional Services (SMPS) Marketing Excellence Awards for the Internal Communications category. 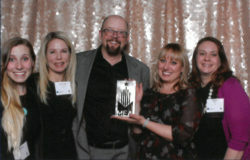 This is the sixth consecutive year that our talented team has won a marketing industry award through SMPS. The winning Base Camp event communications campaign integrated event branding, event planning, printed materials, mail, emails, office posters, projector imagery, videography, give away prizes, live video streaming, on-site Spanish interpreters and many other components. Click here to view the Base Camp highlight video!